To arrive at their conclusion, the JPL scientists did a straightforward subtraction calculation, using data for 2005 to 2013 from the Argo buoys, NASA's Jason-1 and Jason-2 satellites, and the agency's Gravity Recovery and Climate Experiment (GRACE) satellites. From the total amount of sea level rise, they subtracted the amount of rise from the expansion in the upper ocean, and the amount of rise that came from added meltwater. The remainder represented the amount of sea level rise caused by warming in the deep ocean. In other words, all the extra heat is still going into the ocean in the top 2000 metres or so. Before going any further into that, the other paper is relevant here. This work looked at the ocean heat content and sea surface height, comparing the northern and southern hemispheres. What the scientists found was that it is likely that the estimated increase in ocean heat content for the upper 700 metres of oceans has been underestimated. The reason for this is poor sampling of the southern hemisphere. The scientists say there is strong evidence that in regions where the data is sparse, analytical methods have erred on the low side. 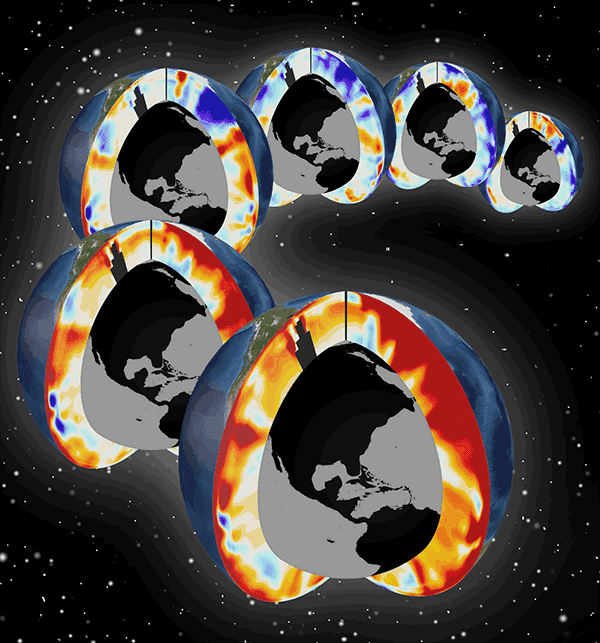 What Paul Durack and his colleagues did was look at the simulated sea surface height changes, after partitioning the northern and southern hemispheres. This matched up with precise altimeter observations. But when they did the same for ocean warming, they found it was not consistent with the observed in-situ-based ocean heat content estimates. They compared modeled estimates of ocean heat content (OHC) change with observations and noted differences. Acknowledging that it could simply be internal variability that was causing discrepancies, they also figured that some of the discrepancies could be the result of either systematic model errors and/or errors in observations. So they looked further. They compared simulated changes in sea surface height (SSH) with satellite altimetry measurements. Steric expansion, water expanding as it gets warmer - which accounts for around 40% of the long term average increase in sea surface height. More water - mass contributions from melting land ice. That is, from the cryosphere. Halosteric effects - from a change in salinity at the regional level. In models where there is no representation from glacial melt, the changes in sea surface height at the scale of hemispheres is almost wholly down to water getting warmer (steric changes). The paper goes into a bit of detail about the extent to which ocean heat content corresponds with sea surface height looking at different depths - 0-700m compared with the full ocean depth.) The upshot is that sea surface height is a pretty good indicator of ocean heat content. So they did some comparisons for different time periods, comparing ratios of sea surface height with ocean heat content for the two hemispheres. The observed sea surface height estimate was within the range of model estimates but the ocean heat content estimates were off until recent years (when there were more observations). That finding lent strong support for errors being in the observations rather than in the models. They looked at it every which way and figured that indeed, the southern hemisphere has been accumulating heat more than was previously estimated. So taking these two papers together, it seems that there has been more heat accumulating in the southern hemisphere oceans than previously thought, and almost none in the deep oceans. These adjustments yield large increases (2.2–7.1 × 1022 J 35 yr−1) to current global upper-ocean heat content change estimates, and have important implications for sea level, the planetary energy budget and climate sensitivity assessments. You can read about the paper at ScienceDaily.com. Crikey! That's a whole lot. If the upper limit goes up to 6.1°C for equilibrium climate sensitivity. Corrected h/t t_p_hamilton in the comments. And see the tweets below Gavin's, there may be more once other things are factored in. I wonder how it effects transient climate response - anyone? Whatever, we'd better get a move on with reducing CO2 emissions is all I can say. The Sceptical Science kidz and Trenberth think that the deep ocean has absorbed all the heat that isn’t showing up in the atmosphere, and that’s [why] we have “the pause”. Well, that’s busted now according to ARGO data and JPL and it has NOT gone into the deep ocean. For once you are right, Anthony. It's not been going into the deep ocean, it's in the southern hemisphere oceans! Worse than that, though. Anthony headed up his article about the deep oceans. You know, below 1,995 metres, with one of "Bob Tisdale's" charts of ocean heat. Guess what it was. Yep, the top 700 metres. It gets even worse than that. Look see. I've put the data from NOAA on top, and Bob Tisdale's chart underneath. They look quite different. Bob and Anthony are hiding the incline, by leaving off the last two years. This first lot are from the WUWT article about the southern hemisphere ocean heat content. DHR has it wrong. Sea level estimates are pretty right, it's the ocean heat content that was underestimated. It was sea surface height that pointed to the errors. Does this mean that sea level has increased more than we thought? Gerry, England is waiting for the ice age that doesn't seem to be comething. What we need is some serious cold to turn the ‘pause’ into a decline and then see them try and argue that out with a straight face. Mind you, given all the data fiddling going on, perhaps they are already ‘hiding the decline’. Steven Mosher better watch out or he'll become a full-blown "warmist" instead of a luker. Maybe he's already made the transition. people complained that the ocean was poorly sampled. The worry was that the sampling was biasing the result.people complained that the land was undersampled and worried the sampling would bias the result. I see the same thing in air temperature records. Ian H got hold of the wrong end of the stick. There were no such assumptions made at all. Honestly, the press release was not that hard to understand. They simply assume that both hemispheres should be showing the same temperature trend and ‘correct’ the southern hemisphere measurements to match the Northern hemisphere ones. And this in the face of very low Arctic ice with record Antarctic ice levels (face palm). I await their next paper with interest. No doubt they will attempt to address this problem by correcting the record Antarctic sea ice measurements to make them match the Arctic ice loss. Actually no – they wouldn’t get away with that. We have photographs. Yet they do think they can get away with doing the exact same thing with deep sea temperature measurements because there are no photos of those. With most of the population and most of the large cities and industrial areas being in the Northern Hemisphere, UHI is always likely to increase temperatures more than in the Southern Hemisphere, which is mainly water. No surprises here….no need to adjust the data. So the models should be made more sensitive to carbon dioxide… with makes their failure during the last 18 years even worse. It’s better than we thought. This next lot are from the deep ocean paper, which was posted second. It just goes to show the short attention span of WUWT readers (among other things). Mark Bofill missed the memo. It’s not in the atmosphere. It’s not in the deep oceans. Cowtan and Way find some at the poles. All? Not by a long shot. Alan Poirier prefers to live in fairyland than here on Planet Earth. There never was any missing heat. Trenberth’s energy budget is simply wrong. Fantasy physics. Dave in Canmore speculates in the silly way deniers do. If Dave can't be bothered looking elsewhere for science, surely he could at least read what WUWT posts. I havn’t done the calcs myself but isn’t the heat capacity of the oceans so massive that even if extra greenhouse heat was somehow being absorbed by the oceans, wouldn’t it be so small as to be unmeasurable anyway? Anyone have any references for this calculation? I don’t bother with OHC data anymore. I’ve been presenting depth-averaged temperature data at different depths recently. OHC data are presented in terms of Joules*10^22 and that makes the warming look astronomical. Presenting it in deg C puts it into terms people understand and also shows how small (miniscule) the actual change in temperature has been. Sou, you need to include Gavin's tweet rights after the 1.1-6.1 one, it is 1.1-4.7 as it stands, may do an estimate using BEST temps. Thanks, t_p. I've changed the tweet to the revised estimate. It's still higher than the upper IPCC of 4.5C but not nearly as much, thankfully. Bravo! A great example of spin. You are doing great work. I particularly enjoyed where you quoted Gavin doing his thing on Durack et al, and implied that that ECS was for Durack *and* for Llovel et al..
Care to do the sums on ECS for Llovel? Clue: it'll be below the one given by Lewis & Curry, as they included IPCC OHC. Face it: The heat is still missing. Levitus thought he'd found it. Now Llovel lost it again. Durack has found a *tiny* chunk of it, and you are screaming that it's all good - Durack has found the lot. Keep your diary free. Mann got a "Nobel Prize" for stuff like this. . I don't know what you are getting at, Rum Runner. Gavin Schmidt would have been very aware of both papers. They can be viewed as complementary works, even sharing an author. The other paper doesn't lower ECS - it would have no effect. "I don't know what you are getting at, Rum Runner. " I think you do. But that was a lovely side-step. "Gavin Schmidt would have been very aware of both papers." "The other paper doesn't lower ECS - it would have no effect." OHC is the one of the major components of ECS analysis (see here for example: http://www.realclimate.org/index.php/archives/2014/10/climate-response-estimates-from-lewis-curry/comment-page-1/#comment-606897). If the OHC data used includes numbers for increases at <2000m then *of course* Llovel et al would lower ECS! Read both papers again, RR, before you make too many more wrong assertions. The findings of the Llovel paper would have very little if any impact on the IPCC's ECS range, compared to the findings of the Durack paper. I have seen several people.on blogs spew their "so trenberth was wrong" crap without realizing that if the ocean indeed warmed more than previously thought, trenberth never needed to be right in the first place! No need for the deep ocean to make up the difference if it turns out there wasnt such a lack of warming to explain. "Overestimated global warming over the past 20 years"
"Recent observed global warming is significantly less than that simulated by climate models. This difference might be explained by some combination of errors in external forcing, model response and internal climate variability." Trenberth was right, and the heat is still missing, Tragedy or not. You do realize that was published before the paper im talking about dont you? The underestimated ohc change hadnt been brought up yet, so using that study as a rebuttal to the point i was making doesnt work. Also prior to Cowtan and Way. Folks may want to find a single dramatic locus for unsampled warming but it's much more plausible to find the energy in a number of different places. Rum Runner's comment is a reflection of rather confused thinking. Models overestimated warming over a substantial but climatologically short period of time. Has nothing to do with missing observations of heat content. Trenberth's latest paper says :"Most ocean-only OHC analyses extend to only 700-m depth, have large discrepancies among the rates of change of OHC, and do not resolve interannual variability adequately ..." and "By using the full-depth ocean, there is a better overall accounting for energy, but discrepancies remain at interannual time scales between OHC- and TOA-based estimates, notably in 2008/09." In other words, most of the missing heat has been found. Kevin E. Trenberth, John T. Fasullo, and Magdalena A. Balmaseda, 2014: Earth’s Energy Imbalance. J. Climate, 27, 3129–3144. @t_p_hamilton - My comment was 100% accurate, as backed up by your comment. Trenberth says "Most ocean-only OHC analyses extend to only 700-m depth, have large discrepancies among the rates of change of OHC"
Trenberth says: "By using the full-depth ocean, there is a better overall accounting for energy,"
i.e. he can only find (most of) the heat if he factors in full ocean depth. Now from Llovel et al we know that there is no extra heat at <2000m - the heat is still missing. The two papers are suggestive not definitive and not the final word. However if the upper ocean heat has been seriously underestimated as suggested by Durack et al, then there's probably more than enough to balance any heat that some might previously have thought may have been in the deep ocean, when trying to balance the energy budget. "@Anonymous - You want papers that are published AFTER these two that were published TWO DAYS AGO? So papers that were published yesterday, or today? o_0"
I don't think you understand my point. You tried to refute my point by linking a paper published well before the paper I was discussing. That paper doesn't work as a rebuttal to my point because the central finding of that paper hadn't been addressed yet and as such the finding wasn't a part of the paper you linked, therefore it can't possibly serve as a rebuttal to that paper. I hope I made that more clear. rum runner, if the southern hemispher upper ocean is accumulating more heat than we thought, there's less "missing energy" and thus less "missing energy" to explain. that was the point I was making with my first comment. 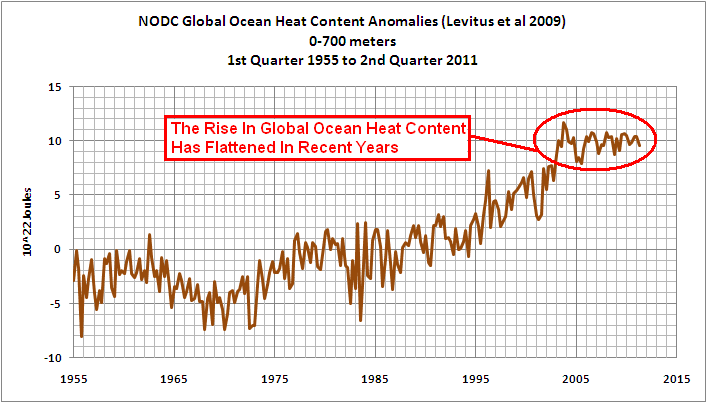 The "heat is missing" is a reference to Trenberth 2009 (rum runner even uses the word travesty, a term Trenberth used in 2009), the heat is mostly found in Trenberth 2014 due to better observations of 700-2000m ocean, which was not known in 2009. Therefore to say that the heat is still missing is actually incorrect and a denial of the fact that the missing heat has essentially been found (to expect an account for every joule is brain dead level of stupid). Go ahead rum runner, claim that this comment also supports you. Don't forget mention of lurkers in email. Extra denier points for tisdale leaving off the period with the highest ohc content on record. Bob's a wag when he writes "OHC data are presented in terms of Joules*10^22 and that makes the warming look astronomical." That's probably because it is astronomical! That much heat will melt over 3 million million tonne of ice at 0 degC to form steam at 100 degC. And, larrikin Bob goes on, omitting the word 'average' in: "Presenting it in deg C puts it into terms people understand and also shows how small (miniscule) the actual change in average temperature has been.". Not that that the omission of 'average' is a big deal as we know what he meant even if he didn't. Being uncharitable, Bob's comment on WUWT suggests that either he doesn't know the difference between heat and temperature or he's having a lend of the Watties. It's probably both, but it could've been worse. Bob could have gone back to the first calibrated temperature scale and used 'degrees' Romer which would have halved the "miniscule" change in deg C. Or he could've used 'degrees' Newton which would have been one-third the "miniscule" change in deg C.
How ironic that WUWT is excited about Llovel et al. 2014, which concludes: "The net warming of the ocean implies an energy imbalance for the Earth of 0.64 +/- 0.44 W/m^2 from 2005 to 2013." In other words, the same people who keep insisting that warming has somehow "paused" are waving around a paper which shows statistically significant warming. Frank Knarf already pointed that out, but the WUWTians were too busy accusing scientists of "outright lying" to respond. I like Steven Mosher's point. It's appears to be an assumption of many of the Global Warming contrarians that more sampling will somehow turn up more cooling. The contrary appears to be the case - more sampling is turning up more warming. Uncertainty is no-one's friend. The global warming contrarians lose their cooling, the global warming proponents underestimate the heating. Is ntesdorf seriously suggesting that UHI will affect ocean temperatures? "For once you are right, Anthony. It's not been going into the deep ocean, it's in the southern hemisphere oceans!" A reread of the referenced material would probably help here. WUWT's article deals with the "Hiatus" missing heat since ~ turn of the century and we've had good argo data for the majority of that time, so no reanalysis required, we actually had the data. The Durack paper "fills in" revised (reanalysis data) since 1970 for the pre argo era. So the fact that there is more Southern Hemisphere heat than previously thought (pre 2004) does nothing to explain the current Hiatus, that recent data is what it as always been. WUWT was a lot less muddled about the claims of the two papers than you have been. "In other words, all the extra heat is still going into the ocean in the top 2000 metres or so." The problem here is "In other words". it's not just the words that are "other" it's the meaning as well. In the original quoted paragraph, there is no mention of "all" or "extra" and if you take those out all you're really saying is the upper ocean layers have warmed a bit and hey so what? Nobody has claimed all of the extra heat has gone there although some of it obviously has. I hope you take the point, sloppy language here is encouraging sloppy thinking. Another form of words that I see on the various blogs (not here I don't think) is "Translating into English". This is never quite what it seems, the original phrase or whatever, was already in English, the translation was required to get it to mean something else entirely. -Sloppy language begats sloppy thinking. I was going to say "crap". Instead I'll be polite and say "I beg to differ". Anthony's two articles were nothing more than copies and pastes of press releases. Don't give Anthony any credit for that. Since you are into picking nits, you should have said that you found the press release from NASA and the press release from Lawrence Livermore National Laboratory "a lot less muddled". The short bits Anthony wrote himself were nonsense, plain and simple. His "claim" in the headline on one paper, telling his fans not to believe it. And his welcome of the other paper with an incomplete chart of ocean heat to 700m when the paper was about ocean heat below 2000m. Also you are mixing up the energy budget with the "hiatus". I said nothing about the latter at all in my article. If anyone was confused I'd say it was you. The Durack paper accounts for a lot of the heat that's been going into the ocean. If you are looking for perfect English expression in a blog article, try WUWT if you think it excels in that regard. I don't think it could be judged so by any yardstick but it's not worth quibbling over. I write in my own style. It's not intended to be text book material, proof read multiple times and playing with words for months to make sure there is no ambiguity and that the sentence structure is perfect. Speed and accuracy is what I aim for. I don't get too many complaints. You must be a WUWT fan. That's the only thing that can explain why you think that the paper about the top part of the ocean didn't find more heat than has been estimated before. It did. As I said. I'm guessing you are from WUWT and are trying to sound educated and knowledgeable. If that's how you want to sound I'd advise sticking to commenting at WUWT. 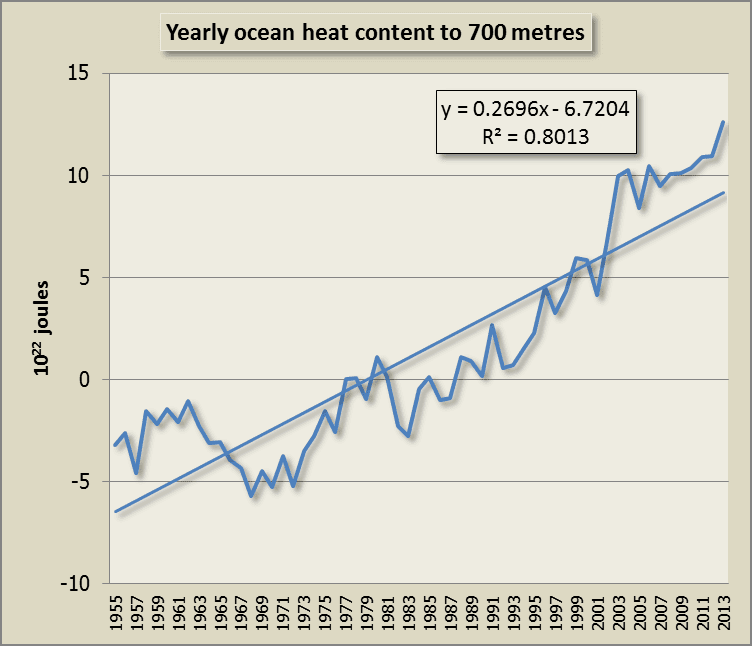 [Sou:] "In other words, all the extra heat is still going into the ocean in the top 2000 metres or so." The planetary energy imbalance is ~0.6 - 0.7W/m^2, so the OHU estimate in L14 would seem to account for all of it. "Before going any further into that [looking at the Llovel et al paper], the other paper [Durack] is relevant here." "I'm going to ignore that paper because it's not "on message" (as it may lower ECS), and focus on the other paper that may raise ECS." <"So taking these two papers together, it seems that there has been more heat accumulating in the southern hemisphere oceans than previously thought, and almost none in the deep oceans." cabc : My thoughts exactly. Heat going into the deep ocean is a good thing; it won't re-emerge for centuries, thus slowing the rate of surface warming. Heat going into the upper ocean during the cool phase of the PDO is all too likely to come back during the next warm phase. If more-than-expected heat is going to the upper ocean and little is going to the deep ocean, and if this situation persists over several centuries, we have a Big Problem. It would seem that on the decadal and slightly longer scale there is at least a partial stratification occurring, at least in the way that heat is dispersed in the oceans. And as the trajectory of heat distribution continues it could well be that this stratification is reinforced, which would have several consequences. It would mean that in the geological short-term at least, the oceans would not continue to be as effective a heat sink as they currently are. And there are physicochemical sequelæ to stratification that would feed back positively to surface warming. I have to agree. OAEs and perhaps eventually - God forbid - a Canfield ocean. Anyone interested in the modern ocean and its many, many problems really should read Callum Roberts' Ocean of Life and anyone interested in the leading role of greenhouse-forced ocean stratification in mass extinction events will be grimly fascinated by Peter Ward's Under a Green Sky. Both very highly recommended. (Amazon links not provided per previous request of a reader here). How well is historic stratification understood? Which is to say, could this be normal high-frequency variation? OT a bit : SkepticalScience has an interesting but slightly disconcerting piece on the Eocene climate. The word "catastrophe" is featured but a PETM-like event is apparently unlikely. It's the more minor catastrophes which are a matter for concern. If you think that measuring the heat in our oceans is a problem. Just look at this little lot and then tell me you understand. Sorry about the reference to wiki but I do not have the references to the originals. This is why the ignorant twits can say absolute rubbish because most of us apart from real scientists do not have a clue as to the depth and breadth of even out dated human knowledge. I am only a mere old and cranky physicist. I do not have all the answers either. I do know when I see made up rubbish by ignorant deniers. It is only my many years of studying science that I know where to look for definitive information with google and then critically assess it for a semblance of veracity.